Suggested Viewing: Play full video first, and than revisit topics by clicking on the chapter markers. Marti Ranky, BS(Hons), is a Registered Dietitian in the USA as well as in the United Kingdom / Europe. She was born and grew up in Hungary, Europe and has co-authored several educational Multimedia publications. She received her BS Honors degree in Nutrition from the University of Surrey, UK, and presents lectures and cooking demonstrations of her 'Paint Your Meals' program from her private practice in New Jersey, USA. (You can contact her through the publishers: cimware@mac.com). 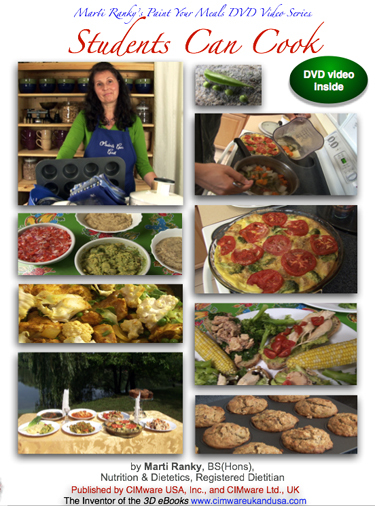 She is also the best selling author of the Enjoy Nutrition, a DVD Duo program. Disclaimer: This program is not intended to give medical advice, make any diagnoses or keep you from seeing your physician. Marti Ranky, BS(Hons) does not claim to prevent, diagnose, or cure any disease. We believe in the individuals' informed right to choose their own health care methods, diet and lifestyle. System Requirements: DVD-ROM: NTSC standard definition (SD) DVD video player for TV, or computer. Approximate length: 45 minutes in 16:9 wide screen format, viewable in regular size TV screens too.